1.1 Who Developed it ? 2 What is Autogenic Drainage? 4 How to do it ? Autogenic drainage was developed in Belgium in the late 1960's by Chevaillier . During 1980's utilized throughout Europe to treat asthmatic patients who had suffered retention of secretions in the chest and difficulty in clearing the secretions. Autogenic Drainage (AD), is an airway clearance technique that is characterised by breathing control, where the individual aims to adjust the rate, depth and location of lung volumes during respiration. 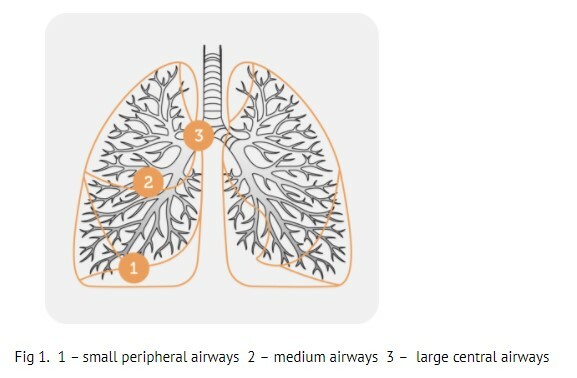 AD is based on a series of physiological principles believed to enable the patient to achieve an independent airway clearance regimen that is adapted to their individual pathology and pulmonary function. The overall aim of AD is to reach the highest possible expiratory airflow in different generations of the bronchi simultaneously with an active, but not forced expiration. 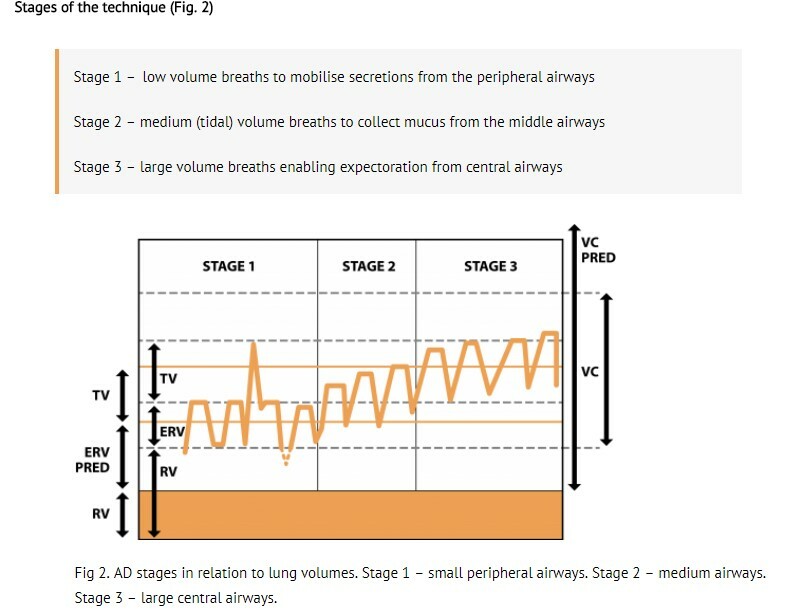 Secretions are systematically transported from peripheral to more central airways by breathing at lower lung volumes in the expiratory reserve volume (ERV), through progressively higher lung volumes in the inspiratory reserve volume (IRV). Chevaillier previously described these three phases as 'unstick', 'collect', and 'evacuate'. Nowadays, these phases are not seen as separate, rather that they blend into one another. Stage 1 :- Unstick secretions - breathe as much air out of your chest as you can then take a small breath in, using your tummy, feeling your breath at the bottom of your chest. You may hear secretions start to crackle. Resist any desire to cough. Stage 2 :-Collect secretions - as the crackle of secretions starts to get louder change to medium sized breaths in. Feel the breaths more in the middle of your chest. Stage 3:-Evacuate secretions - when the crackles are louder still, take long, slow, full breaths in to your absolute maximum. The velocity or force of the expiratory airflow must be adjusted at each level of inspiration so that the highest possible airflow is reached in that generation of bronchi, without being high enough to cause the airways to collapse during coughing. 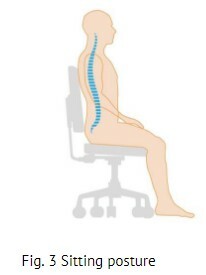 Autogenic drainage does not utilise Postural Drainage positions but is performed while sitting upright. The rationale for the technique is the generation of shearing forces induced by airflow. The speed of the expiratory flow may mobilise secretions by shearing them from the bronchial walls and transporting them from the peripheral to the central airways. Choose a breath-stimulating position like sitting or reclining. Relax, with the neck slightly extended. Clear your nose and throat by blowing your nose and huffing. Slowly breathe in through the nose to keep the upper airways open. Use the diaphragm and/or the abdomen if possible. First take a large breath in, hold it for a moment. Breathe all the way out for as long as you can. Now you are at low lung volume. See picture below. The size of breath and level at which you breathe depends on where the mucus is located. Take a small to normal breath in, and pause. Hold your breath for about 3 seconds. All the upper airways should be kept open. This improves the even filling of all lung parts. The pause allows time for the air to get behind the mucus. Breathe out through the mouth. Keep the upper airways open. This is your glottis, throat and mouth. Breathing out is done in a sighing manner. When you force your breath out the airways can collapse. You will hear a wheeze. At low lung level breathing use your abdominal muscles. Squeeze all the air out until you can breathe out no more. You hear the mucus rattling in the airways when breathing the right way. Put a hand on your upper chest, and feel the mucus vibrating. High frequencies mean that the mucus is in the small airways. Low frequencies mean that the mucus is in the large airways. Using this feedback lets you easily adjust the technique. Crackling of the mucus can be heard as you exhale. You feel the mucus moving up. You feel a strong urge to cough. The level of breathing is raised when any of the above occurs. Refer to the picture below. Moving the breathing from lower to higher lung area takes the mucus with it. Finally the collected mucus reaches the large airways where it can be cleared by a high lung volume huff. Don't cough until the mucus is in the larger airways. Cough only if a huff did not move the mucus to the mouth. You have now finished one cycle. Take a break of one to two minutes. Relax and perform breathing control before you start on the next cycle. The cycles are repeated during the session. A session lasts between twenty to forty-five minutes or until you feel all the mucus has been cleared. Do sessions of AD more often if you still have mucus present at the end of a session. AD can also be performed in conjunction with other airway clearance devices and also positive pressure. PEP: Traditionally AD has been combined with PEP via pursed lip breathing to assist the patient in balancing expiratory forces during AD, or flow modulation. If increased levels of PEP are required to modulate flow, an oscillatory PEP device might be used e.g. PEP mask, Acapella, Flutter, or Cornet. Published studies of autogenic drainage are limited with the majority of trials being in the cystic fibrosis (CF) cohort. The physiological rationale lends support for the use of AD in non-CF bronchiectasis. Most of the studies of AD compare its efficacy with other airway clearance. However, all these studies have methodological problems, for example, small sample size or are of short treatment duration.The ACPCF standards of care outlined strong recommendations to consider autogenic drainage when choosing an airway clearance technique. There is some evidence to suggest that autogenic drainage is as effective as other airway clearance techniques. In a long term study of patients with CF comparing AD with postural drainage and percussion, the patients expressed a marked preference for AD (Davidson et al 1992). In a comparison with ACBT, postural drainage and manual techniques, AD was found to be equally effective in improving lung function in patients with COPD with copious secretions (Savci 2000). Greater expectoration was achieved with AD compared to PEP therapy (Lindemann 1990). The long term effects of AD on quality of life and lung function, compared to other airway clearance techniques, was similar. There are no studies evaluating assisted AD (AAD) in the bronchiectasis population group. In the Cystic fibrosis population, studies have found no provocation of GOR has been associated with AAD, bouncing or the combination of both (Van Ginderdeuren 2001, 2003). Autogenic drainage: the technique, physiological basis and evidence. Paula Agostini , Nicola Knowles . Long-term comparative trial of two different physiotherapy techniques; postural drainage with percussion and autogenic drainage, in the treatment of cystic fibrosis. McIlwaine M, Wong LT, Chilvers M, Davidson GF. ↑ David A. Autogenic Drainage - the German approach. In: J. Pryor, editor. Respiratory Care, Edinburgh: Churchill Livingstone; 1991. ↑ Boyd, S, Brooks D, Agnew-Coughlin J, Ashwell J. Evaluation of the Literature on the Effectiveness of Physical Therapy Modalities in the Management of Children with Cystic Fibrosis. Paediatric Physical Therapy 1994; 6(2):70-74. ↑ 6.0 6.1 Cheavaillier J. Autogenic Drainage. Unpublished course notes: De Haan; 1992. ↑ Davidson AGF, McIlwaine PM, Wong LTK, Nakielna EM, Pirie GE. Physiotherapy in Cystic Fibrosis, A Comparative Trial of Positive Expiratory Pressure, Autogenic Drainage and Conventional Percussion and Drainage Techniques. Pediatric Pulmonology, suppl. 132, 1988. ↑ 8.0 8.1 Pryor JA, Tannenbaum E, Scott SF, Burgess J, Cramer D, Gyi K, Hodson ME. Beyond postural drainage and percussion: Airway clearance in people with cystic brosis. J Cystic Fibrosis 2010; 9:187-192. ↑ Lindemann H, Boldt A, Kieselmann R. Autogenic Drainage: ef cacy of a simpli ed method. Acta Univ Carol Med (Praha). 1990; 36(1-4):210-2.